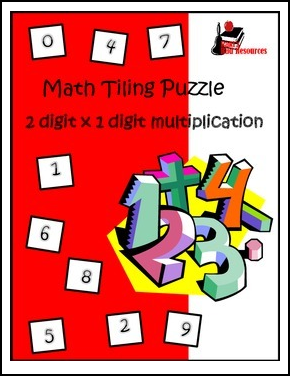 Are you looking for a creative new way to have your students practice multiplication? Try Tiling! In Tiling activities, students will use the provided "digit tiles" to place the numbers 0 - 9 to fill in the holes left in provided multiplication equations. While trying to figure out where the missing numbers go, students will work on basic facts, properties of multiplication and problem solving skills. Simple and easy to use as a homework assignment or a math center. This meets Common Core Math Standards:4.NBT.B.5. It also meets the UK National Curriculum Maths Programme standards for Year 4 and Year 5. This is just one puzzle, which will ALWAYS remain FREE. Find a pack of 10 puzzles like this by clicking HERE .